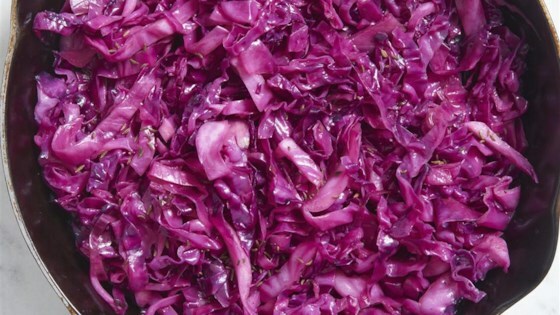 "We're going to cook a very beautiful, super easy cabbage side dish. All ingredients are totally to taste. It's a little bit sweet and a little bit tangy, with a tiny hint of caraway to interest you." Melt butter in a large skillet over medium heat; cook cabbage in the hot butter until it begins to soften, 1 to 2 minutes. Season with salt. Pour in water, red wine, and red wine vinegar. Stir to combine. Mix in sugar and caraway seeds. Continue to cook and stir until liquid has evaporated and cabbage is tender, about 5 minutes. If cabbage isn't quite tender, add a splash of water and continue cooking a few more minutes. There are so many ways to tweak this recipe! Raisins, currants, shallots, onions, leeks, apples, and pears are just a few things that rock in this recipe. Sweet memories of home. My Mother made cabbage this way with Caraway seed which I did today. If I had an apple I would slice and add that as that is what Mom did. Thanks Chef! Great easy basic recipe that can be modified in many ways. I followed the recipe as is this time but will play with it in the future. The recipe was simple. I did not add sugar. Husband and I did not care for the caraway seed in this. Next time, I will omit the caraway seed and add some sliced onions. Overall, not a bad recipe. Excellent! Did not change anything. This is definitely a make ahead recipe. It was so much more flavorful on day two. I think this recipe didn't work for me because my proportions were off.